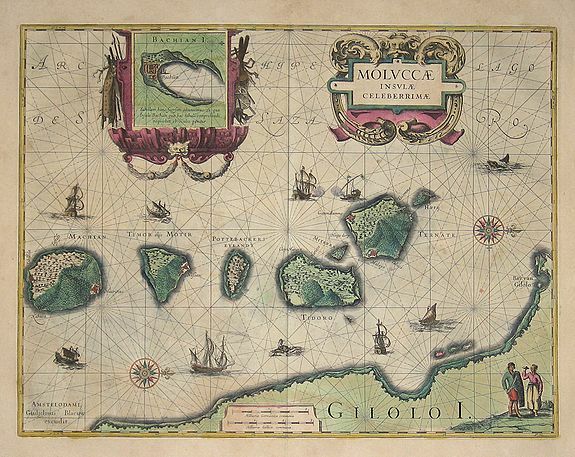 Title : Moluccae Insulae Celeberrimae. Map maker : BLAEU, Willem. Size : 18.9 x 14.6 inches. / 48.0 x 37.0 cm. Description :The map shows the islands of Ternate, Tidore, Mot and Makian. In the top right corner an inset map of the island of Bachian is shown. First atlas map of this region, from the atlas "Tonneel Des Aerdrycx ofte Nieuwe Atlas".